The Cisco Unified IP Phone 7970G fills the communication needs of executive and high-end office environments that conduct moderate telephone traffic. Dedicated voicemail, directories, settings, and services keys are provided to deliver easy access to key features. Illuminated mute and speakerphone keys are provided to give a clear indication of speaker status. A high-resolution, color, touch-sensitive screen provides clear visual indication of the calls that are being handled, and Extensible Markup Language (XML) services deliver a rich user experience. The Cisco Unified IP Phone 7970G offers numerous important security features plus the choice of IEEE 802.3af Power over Ethernet (PoE), or local power through an optional power adaptor while still retaining compatibility with Cisco PoE equipment. 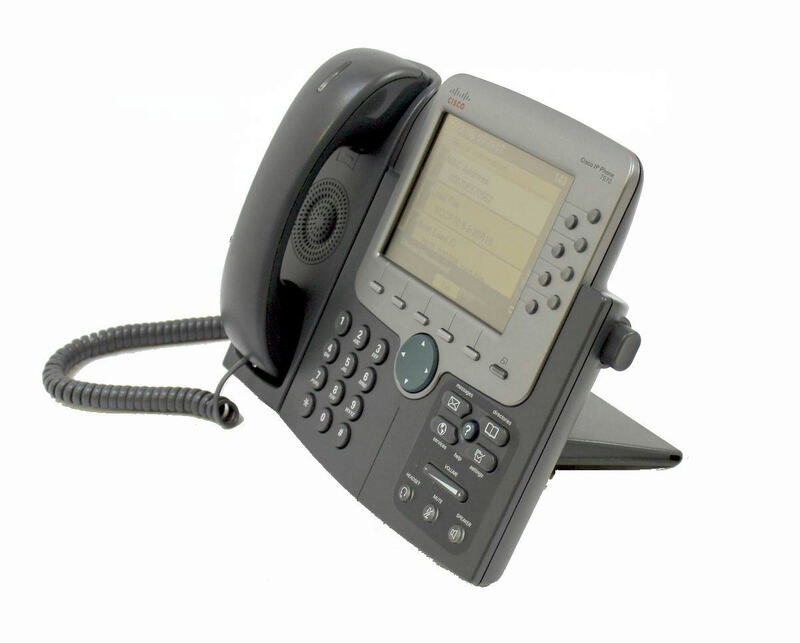 The Cisco Unified IP Phone 7970G is designed to grow with your organization. A dynamic, soft-key driven feature set enables the phone to keep pace with your requirements via regular software upgrades. Moves, adds, and changes are easy: users can simply pick up their phones and move to a new location anywhere on the network. 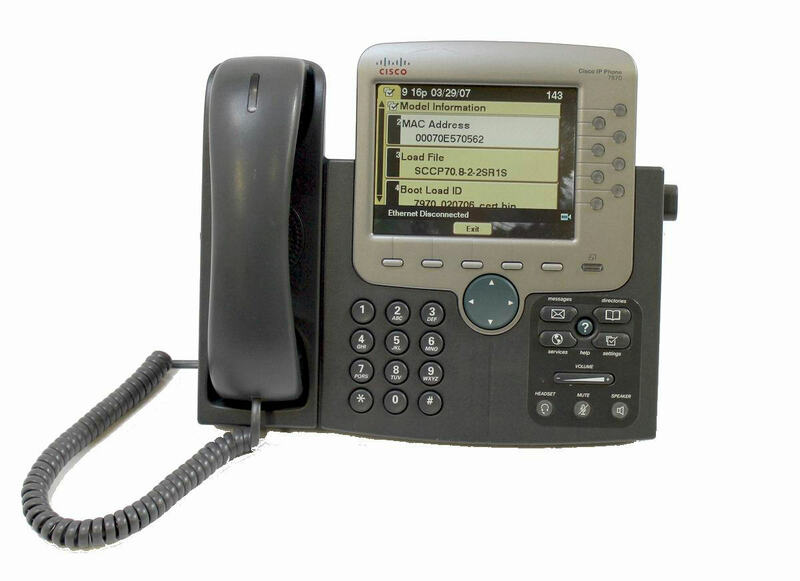 The Cisco Unified IP Phone 7970G also provides accessibility features to those with special needs. Tables 1-7 present the features, specifications, and compliance information of the Cisco Unified IP Phone 7970G, Table 8 provides ordering information, and Table 9 lists available optional accessories. The phone offers direct access to voicemail with a single button touch. The Cisco Unified IP Phone 7970G allows users to quickly access diverse information such as weather, stocks, quote of the day, or any Web-based information using XML to provide a portal to an ever-growing world of applications, features, and information. The online Help feature gives users information about the phone keys, buttons, and features. The pixel display allows for greater flexibility of features and significantly expands the information viewed when using features such as Services, Information, Messages, and Directory. For example, the Directory button can show local- and server-based directory information. The phone has a large, high-resolution, graphical 12-bit color, touch-sensitive display, with backlighting to enhance its visual appearance (320 x 234 pixels). The phone offers high-quality speakerphone technology, including easy-to-use speaker On/Off, Microphone, Mute, and Headset buttons. These buttons are lit when active. For added security, the audible dual-tone multifrequency (DTMF) tones are masked when the speakerphone mode is used. The internal 2-port Cisco Ethernet switch allows for a direct connection to a 10/100BASE-T Ethernet network through an RJ-45 interface with single LAN connectivity for both the phone and a colocated PC. The system administrator can designate separate VLANs (802.1Q) for the PC and Cisco Unified IP phones, providing improved security and reliability of voice and data traffic. 3.5-mm stereo jacks are fitted to the phone for external speakers and an external microphone. The electrical and audio characteristics are similar to those fitted to many modern PCs. However, when connecting externally powered audio equipment to these ports, the phone has no control over electrical signals that may be introduced by this external equipment. For this reason, Cisco can not endorse any external audio equipment that is connected to the phone when it is powered through inline PoE. The Cisco Unified IP Phone 7970G supports IEEE 803.af PoE (Class III). In addition, the phone supports Cisco Prestandard Power over Ethernet (PoE), allowing power to be drawn from any of the Cisco Inline Power-capable blades and boxes. When connected to a Cisco PoE device, the phone will use Cisco Discovery Protocol (CDP) to negotiate the power available. The phone can also be powered locally with a power supply (CP-PWR-CUBE-3). A HAC handset (meeting ADA requirements) is available, as well as HAC compliance for magnetic coupling to approved HAC hearing aids. The dial pad is also ADA-compliant. The phone is supported with Cisco Unified CallManager 3.3 or later, and Cisco Unified CallManager Express 3.2(1) and later. Both SCCP and SIP signaling protocols are supported by the phone when used with a Cisco Call Control agent. The phone supports manufacturing-installed digital certificates, device authentication, and encryption. 802.1X link layer authentication is also provided, requires 8.2(1) or later phone firmware. Support for more than 20 languages is built in (depends on Cisco Unified CallManager software version). Comfort-noise generation and voice activity detection (VAD) programming are performed on a systems basis. RTCP streams are generated by the phone to provide voice quality metrics (requires 8.2(1) phone firmware or later).